The knife is the Zytel Compact EDC Knife, designed by Kit Carson. This Zytel Compact EDC knife features a 3" spear point blade made of AUS4 stainless steel, .08" thick, with a Rockwell hardness of 55-57. 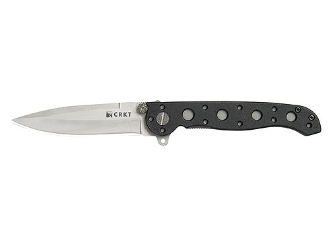 The blade of this CRKT knife has a non reflective bead blast finish, a notched thumb rest, dual thumb studs and Carson Flipper for ambidextrous one hand opening. The drilled textured black Zytel handle, 4" closed, has dual 420J2 stainless steel liners, a liner lock and AutoLAWKS knife safety. A removable black Teflon plated stainless steel pocket clip is mounted at the pivot end of this knife. The Zytel Compact EDC Knife with spear point blade has an overall length of 7.125" when open and weighs 2.3 ounces.